Inside West Asheville are options to explore daily. The French Broad River is the separator between West Asheville and the downtown area. This area includes roads that are over 100 years old, including Haywood Road. Haywood brings to mind the feelings of walking into the past while retaining the modern times all at once. Generational shops exist here that have been opened and owned for 2 or 3 generations. The old buildings here have been renovated and now include everything from Bakeries, Café’s, Restaurants, Pubs & Taverns to Thrifty & Vintage & Consignment Shops which reside side by side with new shops with modern new style boutiques. 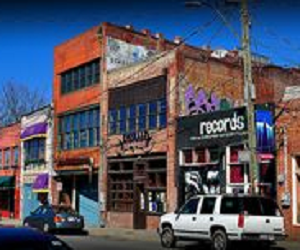 Collectors of music enjoy a host of record shops, while other collectors, will find antiques, the unique, the unusual, the bohemian, the vintage, all available inside this West Asheville area. Haywood is a road where walking takes you from one enjoyment to another quickly and easily. A day of exploration inside West Asheville means to take in the old riverside warehouses. Now known as the “River Arts District”, this is one really special place enjoyed by tourists and the local residents. The old abandoned warehouses now have new life, having been converted into individual Artists Galleries and Shops. Approximately 180+ working artists have their Art here! Definitely a must see when in the Asheville area. Volleyball Courts, playgrounds, basketball, sports fields, roller-hockey rinks, wildflower gardens, trails, dog-parks, wetlands, picnic areas and pavilions, all can be found within the West Asheville area community.